تساهم جزيئات الرنا غير المشفر في أمراض مثل السرطان، التوحد وألزهايمر. بنية ورقة النفل للرنا الناقل للفينيل ألانين (الصغيرة)، والبنية ثلاثية الأبعاد المحددة بواسطة بحوث بالأشعة السينية. تم اكتشاف الأحماض النووية أول مرة بواسطة فريدريك ميسشر سنة 1868  وبحلول 1939 تم إدراك أن للرنا دور في اصطناع البروتين . وبعد عقدين تنبأ فرنسيس كريك برنا وظيفي يتوسط عملية الترجمة وقال أن الرنا يلائم بشكل أفضل التزاوج القاعدي في نسخة رنا رسول من عديد الببتيد. الرنا الريبوسومي هو الرنا الثاني الذي تم اكتشافه، ثم تبعه الرناي (U spliceosomal RNA) في بداية العقد 1980، ومنذ ذلك استمر اكتشاف أنواع جديدة من الرنا غير المشفر: الرنا النويي الصغير، Xist، كريسبر وغيرهم العديد . من الاكتشافات الحديثة المهمة نجد الريبوسويتش والرنا الميكروي، اكتشاف آلية تداخل الرنا المتعلقة بهذا الآخير مكّن كريغ ميلو وأندرو فاير من الفوز بجائزة نوبل في الطب أو علم وظائف الأعضاء. ^ Cheng J، Kapranov P، Drenkow J، Dike S، Brubaker S، Patel S، وآخرون. (May 2005). "Transcriptional maps of 10 human chromosomes at 5-nucleotide resolution". Science. 308 (5725): 1149–54. Bibcode:2005Sci...308.1149C. PMID 15790807. doi:10.1126/science.1108625. ^ ENCODE Project Consortium، Birney E، Stamatoyannopoulos JA، Dutta A، Guigó R، Gingeras TR، وآخرون. (June 2007). "Identification and analysis of functional elements in 1% of the human genome by the ENCODE pilot project". Nature. 447 (7146): 799–816. Bibcode:2007Natur.447..799B. PMC 2212820 . PMID 17571346. doi:10.1038/nature05874. ^ Washietl S، Pedersen JS، Korbel JO، Stocsits C، Gruber AR، Hackermüller J، وآخرون. (June 2007). "Structured RNAs in the ENCODE selected regions of the human genome". Genome Research. 17 (6): 852–64. PMC 1891344 . PMID 17568003. doi:10.1101/gr.5650707. ^ Morris KV, المحرر (2012). Non-coding RNAs and Epigenetic Regulation of Gene Expression: Drivers of Natural Selection. Caister Academic Press. ISBN 978-1-904455-94-3. ^ Shahrouki P، Larsson E (2012). "The non-coding oncogene: a case of missing DNA evidence?". Frontiers in Genetics. 3: 170. PMC 3439828 . PMID 22988449. doi:10.3389/fgene.2012.00170. ^ van Bakel H، Nislow C، Blencowe BJ، Hughes TR (May 2010). المحرر: Eddy SR. "Most "dark matter" transcripts are associated with known genes". PLoS Biology. 8 (5): e1000371. PMC 2872640 . PMID 20502517. doi:10.1371/journal.pbio.1000371. ^ Hüttenhofer A، Schattner P، Polacek N (May 2005). "Non-coding RNAs: hope or hype?". Trends in Genetics. 21 (5): 289–97. PMID 15851066. doi:10.1016/j.tig.2005.03.007. ^ Brosius J (May 2005). "Waste not, want not--transcript excess in multicellular eukaryotes". Trends in Genetics. 21 (5): 287–8. PMID 15851065. doi:10.1016/j.tig.2005.02.014. ^ Palazzo AF، Lee ES (2015). 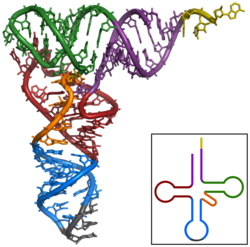 "Non-coding RNA: what is functional and what is junk?". Frontiers in Genetics. 6: 2. PMC 4306305 . PMID 25674102. doi:10.3389/fgene.2015.00002. ^ Dahm R (February 2005). "Friedrich Miescher and the discovery of DNA". Developmental Biology. 278 (2): 274–88. PMID 15680349. doi:10.1016/j.ydbio.2004.11.028. ^ Caspersson T، Schultz J (1939). "Pentose nucleotides in the cytoplasm of growing tissues". Nature. 143 (3623): 602–3. Bibcode:1939Natur.143..602C. doi:10.1038/143602c0. ^ Crick FH (1958). "On protein synthesis". Symposia of the Society for Experimental Biology. 12: 138–63. PMID 13580867. ^ Holley RW، وآخرون. (March 1965). "STRUCTURE OF A RIBONUCLEIC ACID". Science. 147 (3664): 1462–5. Bibcode:1965Sci...147.1462H. PMID 14263761. doi:10.1126/science.147.3664.1462. ↑ أ ب "The Nobel Prize in Physiology or Medicine 1968". Nobel Foundation. اطلع عليه بتاريخ 28 يوليو 2007. ^ Madison JT، Everett GA، Kung H (July 1966). "Nucleotide sequence of a yeast tyrosine transfer RNA". Science. 153 (3735): 531–4. Bibcode:1966Sci...153..531M. PMID 5938777. doi:10.1126/science.153.3735.531. ^ Zachau HG، Dütting D، Feldmann H، Melchers F، Karau W (1966). "Serine specific transfer ribonucleic acids. XIV. Comparison of nucleotide sequences and secondary structure models". Cold Spring Harbor Symposia on Quantitative Biology. 31: 417–24. PMID 5237198. doi:10.1101/SQB.1966.031.01.054. ^ Dudock BS، Katz G، Taylor EK، Holley RW (March 1969). "Primary structure of wheat germ phenylalanine transfer RNA". Proceedings of the National Academy of Sciences of the United States of America. 62 (3): 941–5. Bibcode:1969PNAS...62..941D. PMC 223689 . PMID 5257014. doi:10.1073/pnas.62.3.941. ^ Cramer F، Doepner H، Haar F VD، Schlimme E، Seidel H (December 1968). "On the conformation of transfer RNA". Proceedings of the National Academy of Sciences of the United States of America. 61 (4): 1384–91. Bibcode:1968PNAS...61.1384C. PMC 225267 . PMID 4884685. doi:10.1073/pnas.61.4.1384. ^ Ladner JE، وآخرون. (November 1975). "Structure of yeast phenylalanine transfer RNA at 2.5 A resolution". Proceedings of the National Academy of Sciences of the United States of America. 72 (11): 4414–8. Bibcode:1975PNAS...72.4414L. PMC 388732 . PMID 1105583. doi:10.1073/pnas.72.11.4414. ^ Kim SH، وآخرون. (January 1973). "Three-dimensional structure of yeast phenylalanine transfer RNA: folding of the polynucleotide chain". Science. 179 (4070): 285–8. Bibcode:1973Sci...179..285K. PMID 4566654. doi:10.1126/science.179.4070.285. ^ Eddy SR (December 2001). "Non-coding RNA genes and the modern RNA world". Nature Reviews. Genetics. 2 (12): 919–29. PMID 11733745. doi:10.1038/35103511. آخر تعديل لهذه الصفحة كان يوم 4 يونيو 2018، الساعة 12:04.